There were six trials that Jesus endured prior to his crucifixion. Three of them were Jewish and three were Roman. Two of them involved the Jewish high priest, Caiphas. Perhaps if Caiphas could have told the story it might have sounded like this. It was harder than we thought it would be. Getting him to the point where Rome would demand his crucifixion. The arrest was the easy part. We sent 600 guards to ensure it, but in the end we could have gotten by with one. It was almost as if he wanted to be found. The arrest was Annas’s part. The conviction was to be mine. This Jesus was a dangerous man, and I said so. The testimonies flowing out of Bethany were real. There was little doubt among the people that he had raised Lazarus from the dead. We just didn’t know how. The Pharisees were in a panic. The people were beginning to refer to Him as the Messiah. The tide was turning. We would need to act fast before it was too late. We had already lost our popularity, we were frighteningly close to losing our power. Suddenly the thought was just there in my head, crystal clear. I don’t even know where it came from. But I knew it was the thing that had to be done. “You know nothing at all” I said to council, “it is better that one man die for the nation, then the whole nation die.” That thought galvanized the men. We knew what we had to do. The payment of false witnesses was something we had done before. We weren’t proud of it, but sometimes it was necessary. And believe me when I say this: this time it was necessary. You couldn’t find anyone willing to bring something against this man…It was almost as if he were perfect. But he couldn’t be perfect, when His presence irritated us so much. He had such blatant disregard for our authority. It was like he didn’t recognize the fact that we were in charge. But that would all be different on this night. You don’t try to overturn our religious establishment without paying a price. The false witnesses were a fiasco. We were trying to do this all so quickly that we had not prepared them well. Their stories contradicted each other. And the more witnesses we brought the more confusing it became. There were those on the council who would not vote for his execution, unless they were fully persuaded. In all of this Jesus sat in silence, and I regret to say this, but his silent defense was effective. Even a fool could see that the witnesses were making this up. I could feel it slipping away. The door of opportunity was closing. So I took matters into my own hands. I stood up and addressed him directly. “Have you no answer to make to what these men testify against you? I was greeted with the same silence as before. So I goaded him. “Are you the Messiah the Son of the Blessed One?” The question just hung in the air. And for the first time the room was silent, and into that silence Jesus spoke. It’s as if He had been waiting for the question to be asked. “I am the Messiah,” He said, “and you will see the Son of Man seated at the right hand of power and coming with the clouds of heaven.” This was more than I had expected. He had just equated himself with God. “It’s blasphemy!” I cried. We don’t need these witnesses He has testified against Himself!” I tore my garments, a bit of an act I confess, but it was effective. The rest of the leaders followed by example, it was free-for-all. In the confusion I knew it was time to ask the council the question. So I turned to them and raised my voice above the noise, “What is your decision?” I cried. And to a man they all condemned him to die. His answer was so unexpected. Why had he not been so forthright in these claims before? It was almost as if He wanted to die, but that’s ridiculous, why would anyone, especially one as popular as he, want to die? 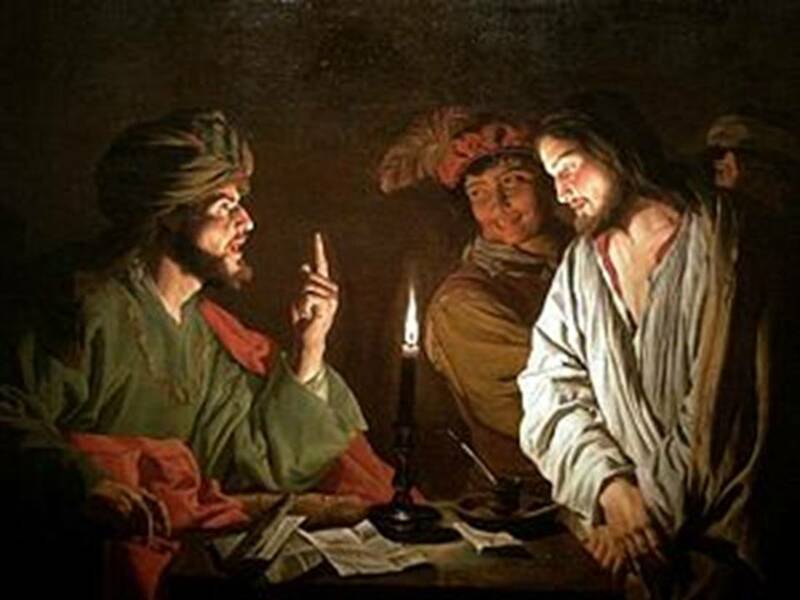 This entry was posted in Easter Week, The Humanity of Jesus and tagged caiphas, trials of Jesus. ← What does a King desire?